"At less than 11,000 square feet and with only 125 parking spaces, the current SCV Senior Center NO LONGER MEETS THE NEEDS of the existing senior community - and the facility will be unable to provide for the huge SCV-senior population growth that's expected between 2020 and 2035. 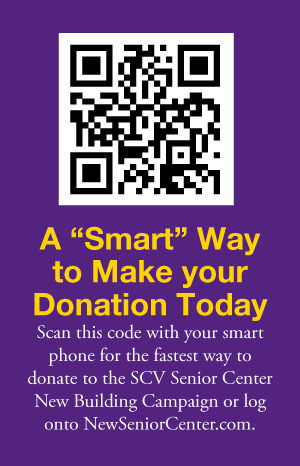 Today's - and tomorrow's - SCV seniors need a new SCV Senior Center now... and they can have it with your donation made today at NewSeniorCenter.com." For a moment, think about the seniors in your life - the crossing guard on your street, the neighbor who always waves to your kids, the volunteer at the library, the veteran next door, your beloved family members. Think about how those individuals have positively contributed to your life, the lives of those you love, the community where you live and the country you call "home." Now think: If your favorite senior asked you for $31 to put towards a new Senior Center - one that was better able to provide for their unique needs and capable of offering them a marked boost in their quality of life - would you give it to them? Of course you would. In fact, you'd probably give them more. And that's exactly what the SCV Senior Center needs from you right now. Chances are, the local seniors you appreciate the most benefit from the resources made accessible at the SCV Senior Center - and that organization needs your help today. Here's why. The SCV Senior Center building in Newhall is the site where essential services and resources are provided to over 10,000 local seniors - including the seniors you care about the most. It's an impressive feat that, in great part, is accomplished thanks to a tireless network of volunteers and a small-but-mighty staff. But while the community of professionals and volunteers do an incredible job providing healthy meals, continuing education, trusted referrals, adult-day services, recreation, socialization, fitness and more, the building itself is no longer adequate for the population it serves. "Few know that, while the SCV Senior Center has been functioning in the current location since 1983, the building itself was originally constructed as a church in the 1960s. The NEW SCV SENIOR CENTER will be built to provide for today's seniors' most pressing needs, including improved access to tech education and resources; a fitness center; care for seniors with cognitive impairments; a large common space for socialization; and so much more. IT ALL BECOMES POSSIBLE when each of us make a donation at NEWSENIORCENTER.COM." The good news is that, after four years of studies and behind-the-scenes efforts, there is only $1.75 million remaining to be raised before groundbreaking can begin on the new Center. That's where you, me and the entire SCV community come in. The SCV Senior Center New Building Campaign is promoting their "$31 by the 31st" fundraiser, asking every member of our community to make a $31-or-more donation by July 31, 2017. "The more community support we can garner, the more successful we will be in soliciting grants. These foundations want to see a clear commitment on the part of the surrounding community, a sign that those that will benefit are invested in the project and the mission," says SCV Senior Center Executive Director Kevin MacDonald. "The phrase, 'Many hands make for light work,' comes to mind here," says SCV Senior Center New Building Campaign Co-chair Peggy Rasmussen. "If everyone gives a donation they can comfortably afford, we'll be able to break ground on the new Center as early as this summer. 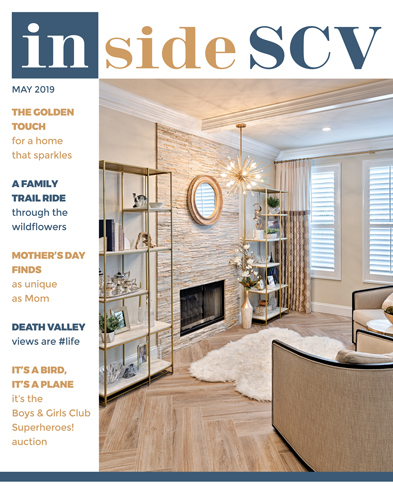 The sooner we complete this fundraising stage, the sooner the seniors in our community can gain access to a building that will be customized to best connect them with the resources and services that will improve their quality of life." When you make your $31-or-more donation to the SCV Senior Center New Building Campaign, you're not just helping pay for concrete and bricks. This Center isn't about a "building," it's about the services and support housed within; it's about seniors having a place to gather, grow and learn - now and in the future. The new Center will boast a dedicated Culinary Arts Kitchen where seniors can learn how to cook for one or two; prepare healthier meals that taste good to their changing palates; and connect with family members and friends new and old during inter-generational classes. The Health & Wellness Center, as well as the Fitness Center, will provide seniors with the opportunity to "age well" with vital health screenings and exercise that improves cognitive function and reduces feelings of depression and isolation while strengthening the body. The new Technology Center will host classes to improve senior tech literacy; reduce cases of online senior abuse; serve as a springboard for better familial and social relationships online and better connect seniors to the opportunities an understanding of today's computers and systems offer. At the Employment & Financial Center, seniors will be able to identify volunteer and paid-work opportunities and connect with vetted financial experts who can provide advocacy and advice. These programs and more - like the Expanded Adult Day Service, Fashion Center, Cafe and others - will call the new two-story Center home... with your help. Make your donation today at NewSeniorCenter.com - so that our seniors can have a better tomorrow! CAN YOU HELP SCV SENIORS NOW? Make your most generous online donation by July 31 by logging onto www.NewSeniorCenter.com and clicking on the "Donate" tab at the top of the page. It will take you less than two minutes to make a lasting contribution.